Kanakadasa Jayanthi is an annual festival celebrated in the Indian state of Karnataka, particularly by the Kuruba community. It commemorates the birth anniversary of Kanaka Dasa, a renowned poet, philosopher, musician and composer from present-day Karnataka. 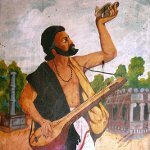 Kanaka Dasa (born Thimmappa Nayaka) was born on November 6, 1509. Little is known about his early life. According to one of his compositions, he was severely injured in a war and almost died. After that, he gave up his occupation as a warrior and devoted his life to composing poetry and music, explaining philosophical concepts in an understandable language. In his works, Kanaka Dasa mostly depicted day-to-day life activities of common people. His poetry also dealt with social issues, such as conflicts between rich and poor, as well as the caste system, which he criticized. He also wrote over 200 Karnataka music compositions. In tribute to Kanaka Dasa and his legacy, the Government of Karnataka has declared his birth anniversary an official holiday. On November 6, all government offices and educational establishments across the state are closed. The celebration includes various cultural activities dedicated to Karnataka’s greatest poet.